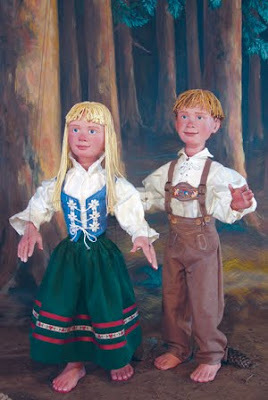 The award winning Tanglewood Marionettes company will be traveling to a number of different US states with their fairy tale marionettes over the next few months. The first offering will be at the Mid-Hudson Children's Museum, where they will be performing their newest production, Hansel and Gretel" on Monday October 12, 2009. Founded in 1993 by Anne Ware and Peter Schaefer, Tanglewood Marionettes is a nationally touring marionette theater based in New England. Our repertoire consists primarily of classic tales performed by skilled puppeteers who have spent many years perfecting their art. Each of our productions runs approximately 45 minutes, which may include a lively puppetry demonstration prior to the show and an optional question-and-answer period following the performance. The program is presented with the marionettes in full view, so that the audience can witness firsthand the mechanics of puppet manipulation. Upcoming public performance details in various states over the next few months can be found HERE. Their current repertoire includes "Hansel and Gretel", "Cinderella", "Sleeping Beauty", "An Arabian Adventure", "The Fairy Circus" and the award winning "The Dragon King". 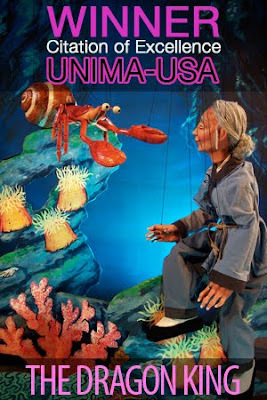 You can see some more of their lovely puppets and get information on their performance set-up HERE.